Rob will typically travel to the client’s location which provides an element of personal lifestyle and surrounding for the painting. Together you will gather the information necessary to complete a true likeness. Choices regarding the pose, setting, clothing colors, lighting, mood, and what objects might be surrounding the client will be sorted out. Rob will spend a bit of time doing sketches of the client in position to get a feel for what will work in addition to photographing the subject in various settings. The sketches will involve ink, watercolor, chalks and even oil studies. This meeting normally takes between two and three hours. Within a short period of time, he will present you with several studies from which to choose for the final painting. It is also helpful for Rob to see where the portrait is intended to hang. He will have insight as to what type of frame will work well with your painting and in your home. Rob can then begin work on the portrait in his studio. Additional sittings are recommended in order to complete the painting. Rob will sometimes ask to borrow some of the clothing the client plans to wear in the painting to use as source material while he completes the project. Most clients wish to review the painting a third or halfway through the process and will either come to the studio or will be sent photos if distance is a factor. For portrait options and pricing, see Rob’s pricing information page. 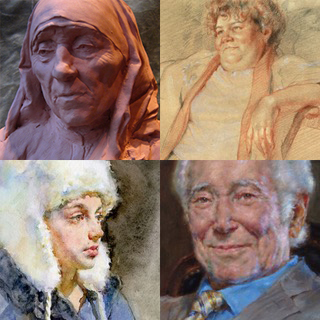 Rob is also available to do sculptures, whether it is a portrait (bust or head), pet, or whatever you are interested in having sculpted in terra cotta or cast into bronze. For pricing, see link above.